Geri Allen (June 12, 1957 – June 27, 2017) was an American composer, educator, and jazz pianist. She was born in Pontiac, Michigan and raised in Detroit. Allen worked with many jazz musicians, including Ornette Coleman, Ron Carter, Tony Williams, Dave Holland, Jack DeJohnette, and Charles Lloyd. 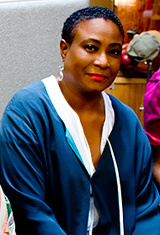 She cited her primary influences to be her parents, Mount Vernell Allen Jr, and Barbara Jean Allen, and her primary musical influences to be mentors Marcus Belgrave, Donald Walden, and Betty Carter, as well as pianists Herbie Hancock, Mary Lou Williams, Hank Jones, Alice Coltrane, Cecil Taylor, Thelonious Monk, McCoy Tyner, Bud Powell, and mentor Dr. Billy Taylor. Allen was an Associate Professor of Music and the Director of the Jazz Studies Program at the University of Pittsburgh. Allen died on June 27, 2017 in Philadelphia, Pennsylvania after suffering from cancer at the age of 60. ↑ Cook, Richard (2005). Richard Cook's Jazz Encyclopedia. London: Penguin Books. p. 8. ISBN 0-141-00646-3. ↑ Adlet, David R. (27 June 2017). "Geri Allen, Brilliantly Expressive Pianist, Composer and Educator, Dies at 60". WGBO. Retrieved 27 June 2017. This page was last changed on 1 April 2018, at 23:00.